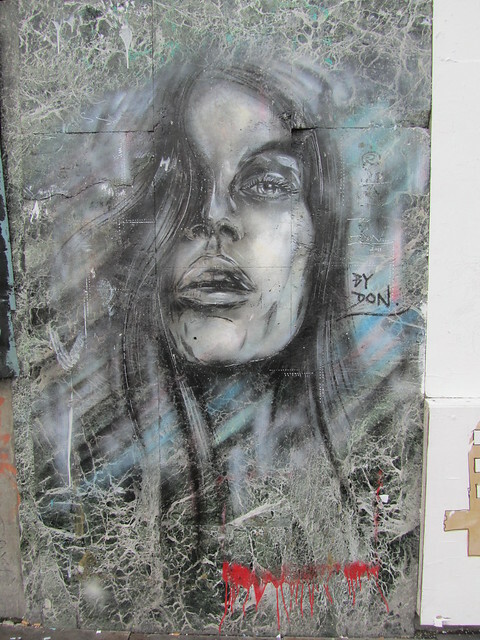 Do you remember back in March when I had a chance encounter with one of my favourite graffiti artists Paul “DON” Smith? Well, he kindly agreed to do a quick interview with me by email, and it gives me great pleasure to share it with you today. 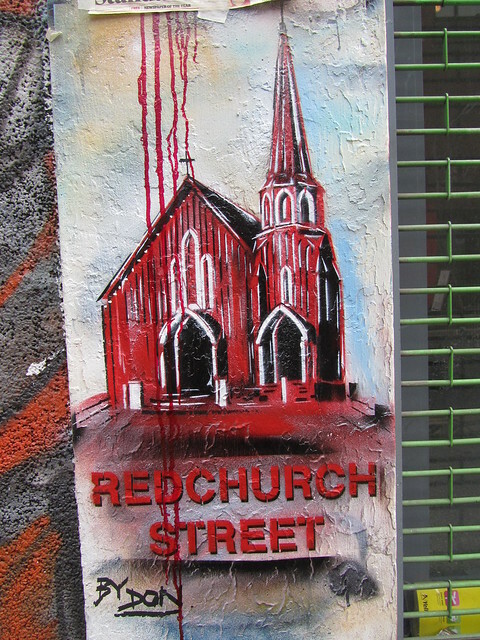 Naturally, I’ve included a lot of images of his work, too. Enjoy! So, should I call you DON or Paul? LOL. Don is great, but pauldonsmith.com could be better, so you know how to get hold of me. 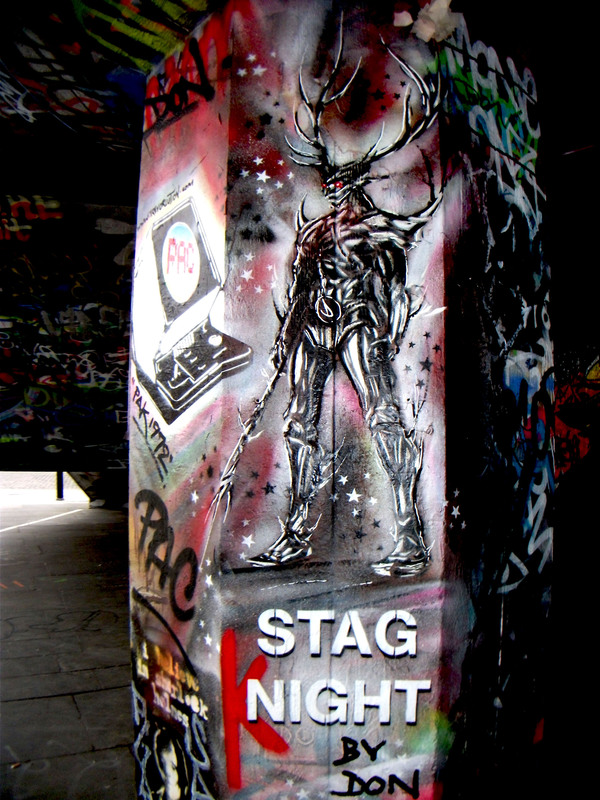 How long have you been producing street art? 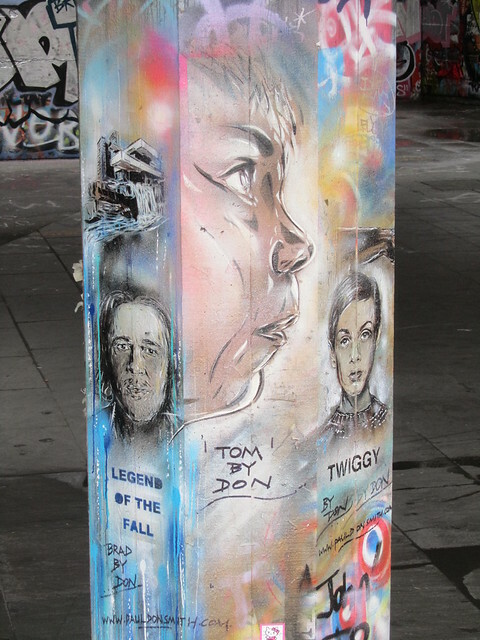 I have been an active graffiti artist for 25 years, but my recent street art, where I create images that I think an audience/people may like, has been a shorter time; say 5 years or so. Have you always worked with stencils, or do you ever use different techniques? I have mostly been a freehand spraycan artist, but I am now a mixed medium artist, I have starved myself long enough, I am free. 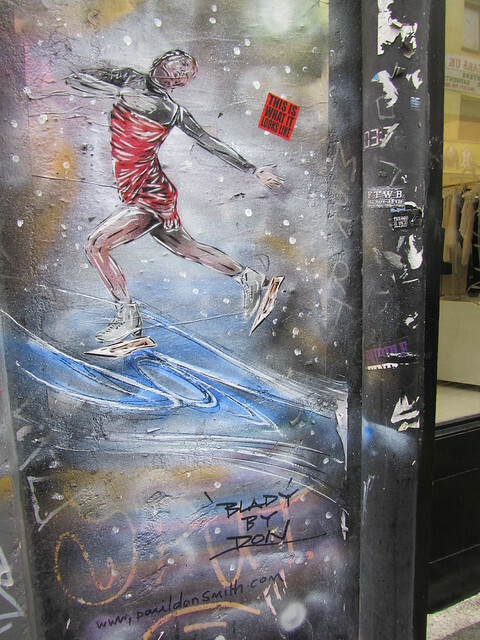 Why do you choose to make street art, rather than painting on canvases and exhibiting in galleries? LOL. I do both, but mostly its on the streets, for now I paint originals and paint original limited editions, through selected galleries or my website. Have you ever got in trouble for painting somewhere you shouldn’t have? If so, what happened? I used to get into a bit of trouble, but that has long gone; my teenage years, many years back. The police know of all my illegal work, as they offered me a clean slate if I could tell them of other works. It saved time them knocking at the door again, me time and them time, it’s called “taken into consideration” (TIC). Do you have a “day job”? Yes I am a self-employed graphic designer. 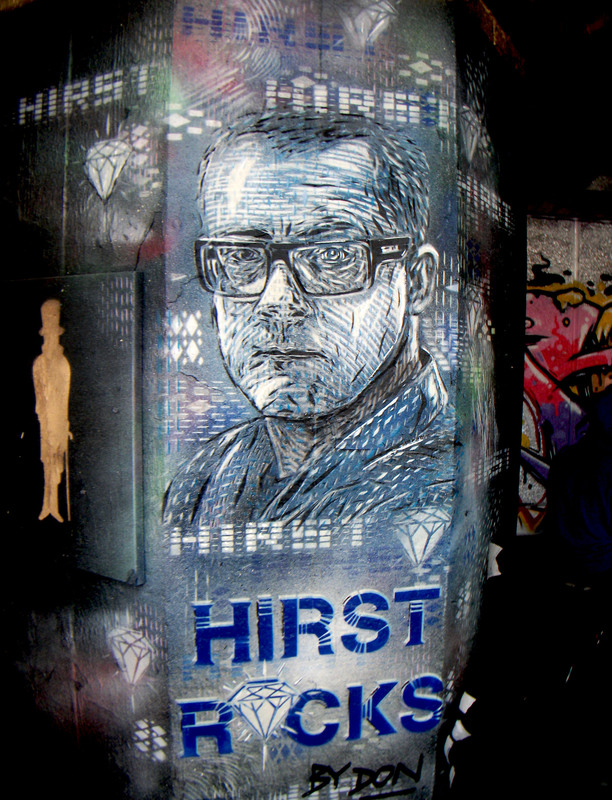 Do you have any objections to your work being referred to as “graffiti”? 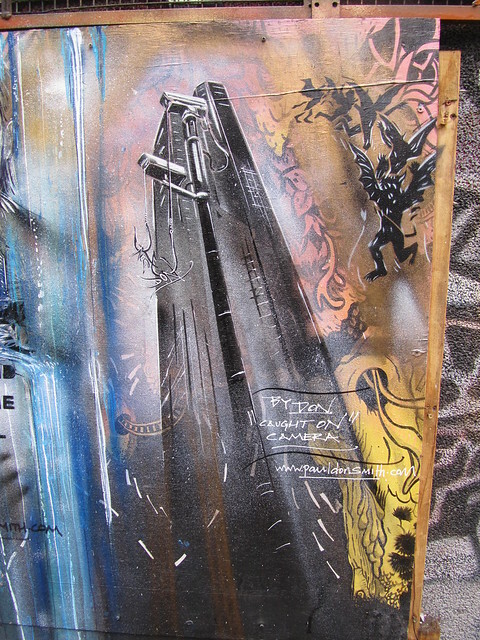 Is there a difference between “graffiti” and “street art” as far as you’re concerned? Not really, I am just more selective now on the locations. It’s all the same, it’s just if the audience can communicate with it or not, if it has a message or is it just ‘ME’ ‘ME’. 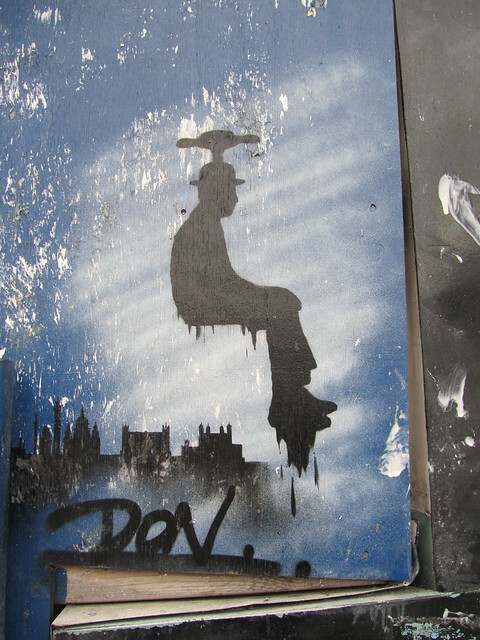 The market has opened up with the wonderful success of Banksy and Blek. You seem to paint a lot of portraits (which is why I love your work!). Is there a reason for this? I think it’s a nice thing to see. One will identify with it quickly and may find it endearing. I tend to stick with portraits that influence myself and I am reaching out to see if others feel the same. Artists, musicians, actors, writers, thinkers, designers, distinguished characters, also portraits of individuals who the audience/people do not know and it’s interesting to place them on the world stage. I’ve noticed a slight religious theme to your work recently. What’s that all about then? Powerful images are amazing to paint. 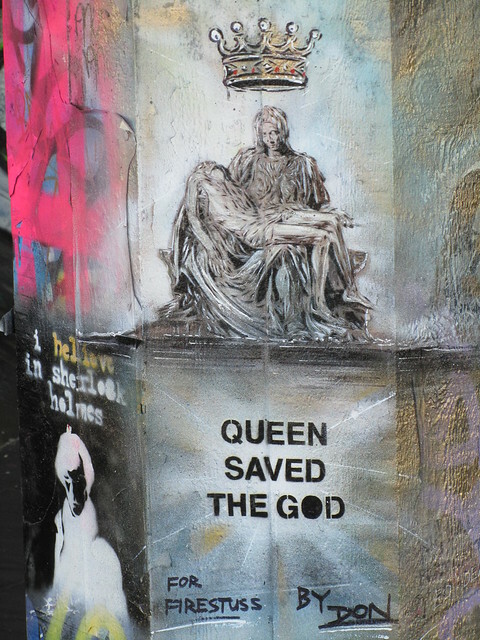 I do little twists too with this, like “Queen save the God” [below], I had not seen it reversed before and thought it was nice as the Queen/monarchy is head of the church. Keep the faith, it’s a great thing, like humans, we are powerful. Monet, Turner, Constable, Duster UA, Rodin, Hodgkin and many others. 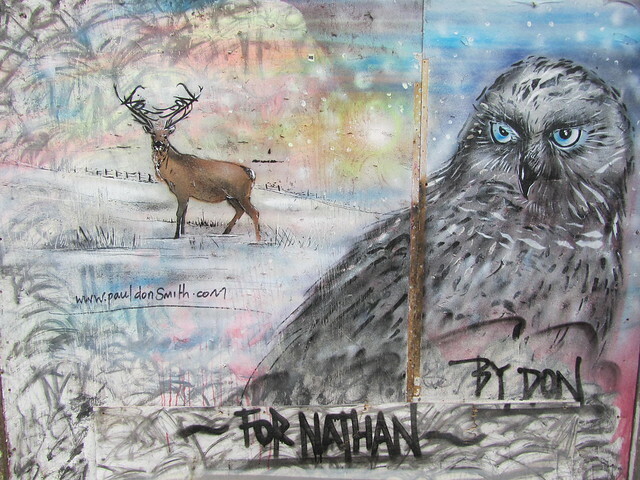 Is there anything else you’d like to tell my readers about your work, or about street art in general? More to come so watch this space! A big thank you to DON for taking the time to talk with me! 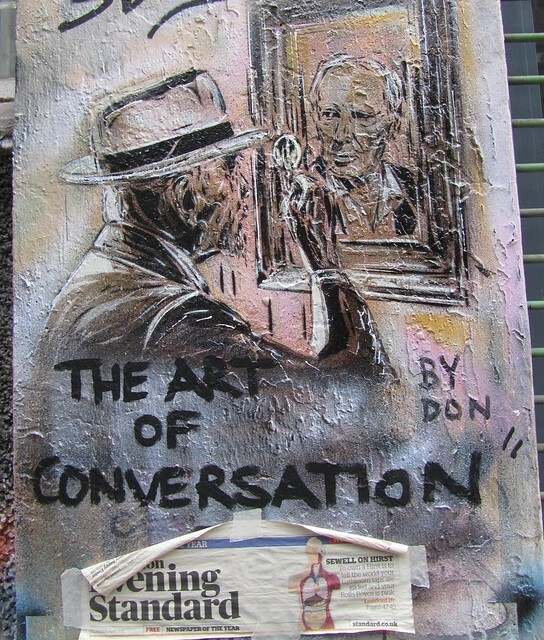 For more information about DON’s work, please visit his website: pauldonsmith.com. I hope to do more interviews like this and in person in the future, so watch this space and do get in touch if you’re an artist who would like to have a chat. What inspiration! What an amazing guy! A true true artist and not intimidated by media requirements. Let’s just say this guy needs a big break, a working artist in the genre of 19th century emotions and commitment. Fantastic! 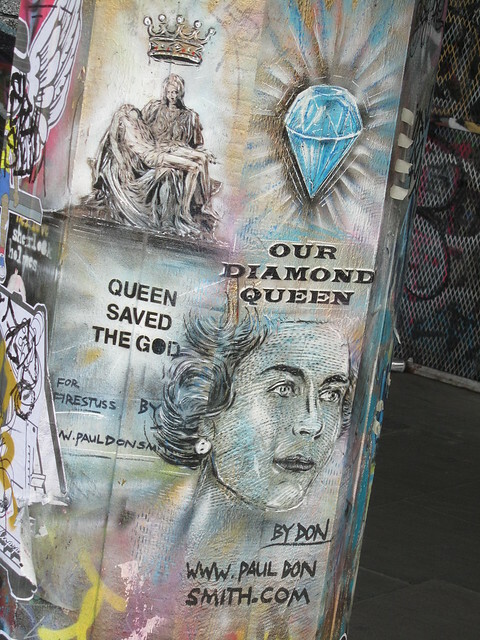 I encountered Don’s work in Brick Lane recently, where he did a tribute to Nelson Mandela, I thought it was outstanding! People were stopping by to look. I took a photo of it, if you’re interested in seeing it then drop me a mail. Yep, that’s the one! It’s an absolute beauty!